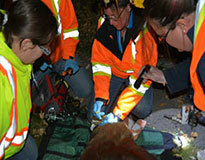 "Keeping people safe and wildlife wild"
What can the CNP Bearsmart Association do for you? 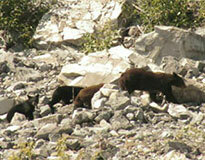 We loan bear-resistant garbage bins in the Crowsnest Pass based on evaluated need. A bear-resistant bin affords you the option of putting out your garbage before garbage day and not attracting a bear, or having the bear create a mess by tearing through your garbage. 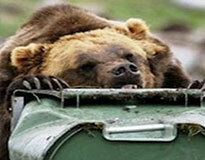 If a bear tangles with your bear-resistant bin it will not be able to break it open, will lose interest, and move on. Keep your property safe and the wildlife wild with a bear-resistant bin. Contact us to loan one today! Contact Lost Creek Services to buy one today! 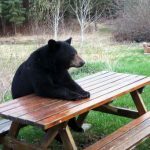 Let us survey your property for bear attractants and help you manage your gardening, waste management, recycling and fruit-bearing vegetation. You’d be surprised at what will attract a bear to your property. No fee for this service, contact us today! Fruit-bearing vegetation and trees like apple trees are a major attractant of bears. For individuals unable to pick the fruit due to health or safety reasons we can pick it for you. Keep your property safe and the wildlife wild by having our team do the work. We can even arrange for an arborist to prune your apple trees at a discount. No fee for apple picking, call us today! Do you or your employees work in bear country? 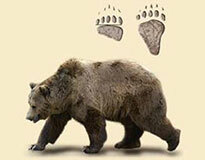 If you do then bear awareness training is essential to your safety and to avoid conflicts with bears. Review our course outline under ‘training’ and contact us to arrange a class for your organization. We also run two free public classes a year in the Spring and Fall. Join Our Newsletter Simply Enter your Information to our Free Information, Advice And Tips ! The annual fundraising raffle is here! © Copyright 2016. CNP Bear Smart. All Rights Reserved.